Well it seems that when you are around kids, the grown ups in us come out. And that was certainly the case in this past episode of Project Runway. The designers were paired with kids to assist them in a painting that would serve as their inspiration for their design this week. Everyone put their age forward, along with their fashion sense, and put away their claws, at least for this week. ;) The concept of wearable art turned out some of the most outrageous fashions we’ve seen this season. From Bert’s Cirque du Soleil’s crazy pants to Laura’s ethereal fairy dress that resembles a reinterpreted rose. So, ‘What Would Project Runway Shoe?” (#WWPRS) is about pairing a shoe or two with the winning look of the week. SPOILER ALERT! Stop reading if you want to wait and watch the episode first reading about the winning design. Well our southern belle, Anthony Ryan (#PRAnthonyRyan), finally was elevated to bride status from being the eternal Project Runway bridesmaid. ;) Anthony Ryan wowed the judges with his almost literal translation of his inspirational self portrait painting. The decision of going with the bold brush strokes for his main design element in his dress won the tougher than usual judges including Kenneth Cole and Zanna Roberts Rassi from Marie Claire. Now, should the dress be made available for little ol’ us to purchase, and should the dress be made, say a little mini dress, I would HAVE to go with the ‘Roza’ by Sam Edelman. There is something about the spikes on the back of this heel that just DEMANDS to be worn with the mini version of this dress. It carries just the right amount of attitude that goes with avant guarde fashion and today’s modern working girl. 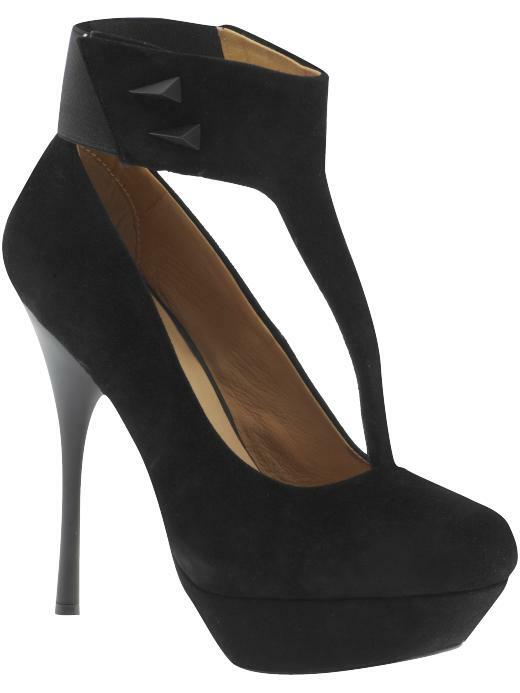 ;) The 4 ½” heel with 1” platform make this a truly wearable heel for an urban night on the town!